On the second day of our trip to the coffee and cacao plantations, Easter morning, we awoke to a delicious breakfast: a platanos con leche (bananas with milk) smoothie, fried yucca, fried plantains, cheese, bread, eggs, and, of course, coffee we had prepared the day before. Then we walked about 20 minutes to Raul’s six-acre cacao plantation, Plato de Palta (Avocado Plate), the only farm in this community growing cacao in the native way. But, many other plants grow here as well: papaya, bananas, avocados, coffee, mandarin, and more. Raul grows the native Chuncho cacao, whose fruit is smaller than the more prevalent hybrid varieties. 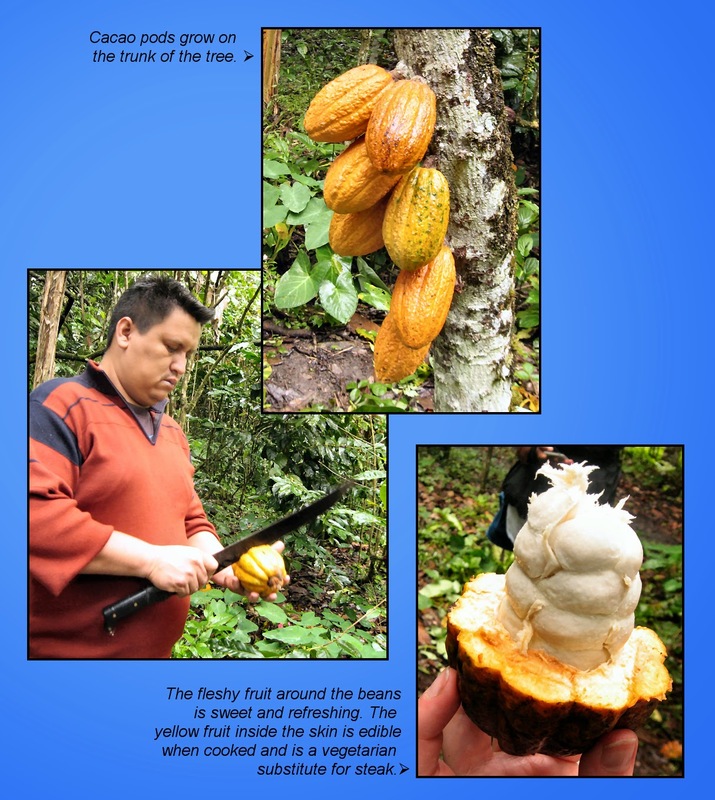 Cacao is ripe when the fruit turns yellow and it is harvested here from December through April. Raul’s farm is a bit high in altitude for growing cacao, but even so, with climate change, his harvest is now being extended into May and his production is increasing each year. Like coffee, cacao utilizes the potassium that is released to the ground when nearby banana tree trunks are cut. but is second in the production of organic cacao. 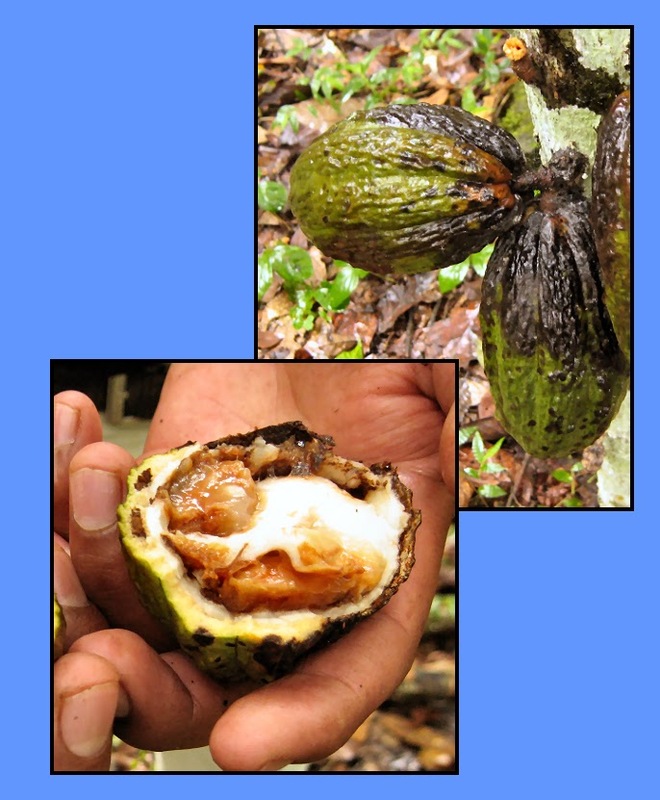 A major disease of cacao, which causes the pods to rot, is carried by a small fly, and since this is an organic farm, and like Julia and Jose’s farm, must retain its organic status, a natural “brew” is concocted to spray on the fruits. Consisting of banana trunks and leaves from the Pacai tree, sugur, salt, ash, blood from chickens or cattle, and water, the concoction is fermented for two months. It is then heavily diluted and sprayed on the pods to prevent the fly from boring into them. This practice prevents about 65% of the disease. We moved on to Raul’s compound to make and eat chocolate! After being fermented for 3–4 days, the beans are sun-dried to 8% humidity. 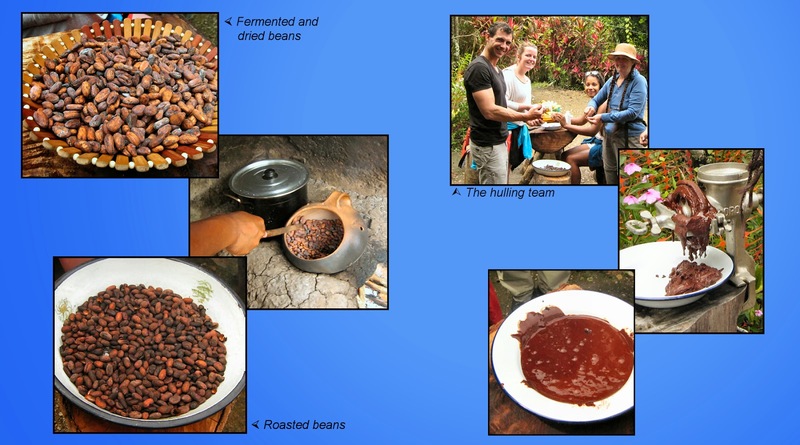 Raul provided some fermented and dried beans to roast. Then we had to husk each bean by hand before they were ground (again, in a small molino) into 100% chocolate paste. You can tell from the photograph how much oil is in the beans—the paste is the consistency of room-temperature peanut butter. 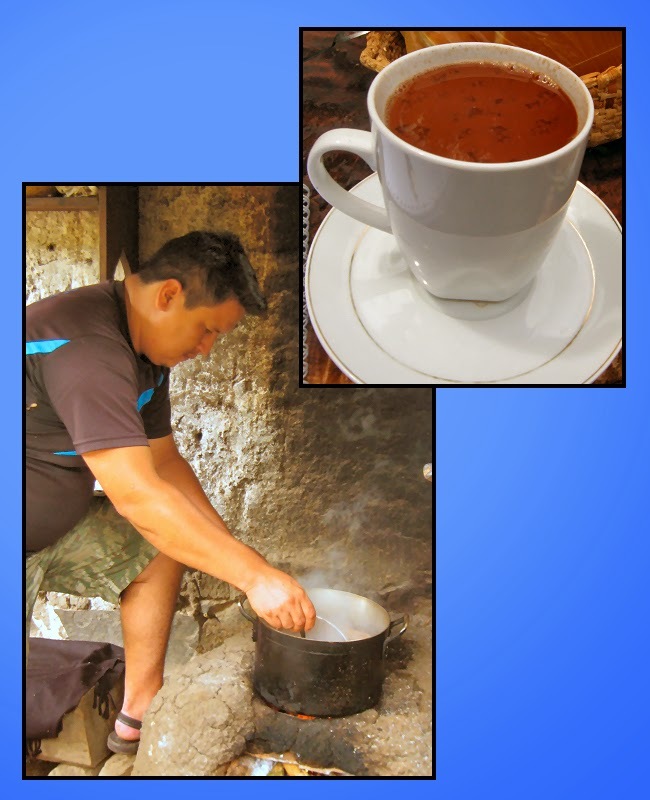 While Raul prepared some traditional hot chocolate using water (not milk), we had the opportunity to try the paste on bread, bananas, and mandarin. But my favorite, above all, was the 100% unsweetened paste on perfectly-ripe avocado. It was like drinking good wine, with all the different flavors that continued in my mouth for a minute or more after being eaten. Then we were served the luscious hot chocolate. A lot of jokes were made about it being Easter and a perfect day for eating chocolate. We were surely taking advantage of that excuse. 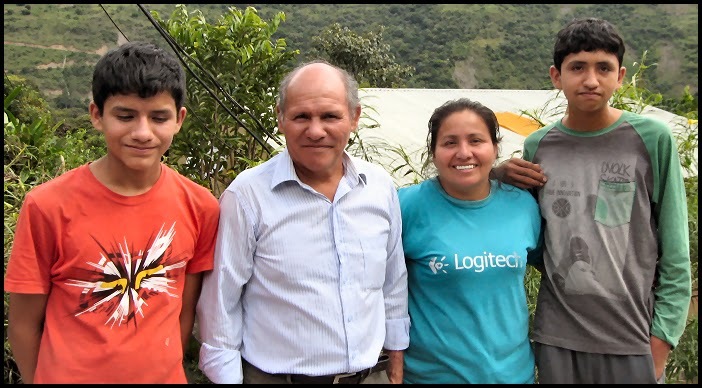 Raul and his mother, Margarita, send half of their crop to the cooperative or traders and keep the other half to process themselves into 100% organic chocolate bars. We walked to Margarita’s house in the nearby village to purchase some of this ambrosia and were welcomed with open arms. Margarita even brought out her dancing parrot to perform for us. She, Margarita not the bird, gravitated toward me, I think, because I was so close to her in age. Smiling and laughing, she hugged me several times while we were there and seemed to be delighted that I came to visit. I purchased several 400-gram (almost a pound!) 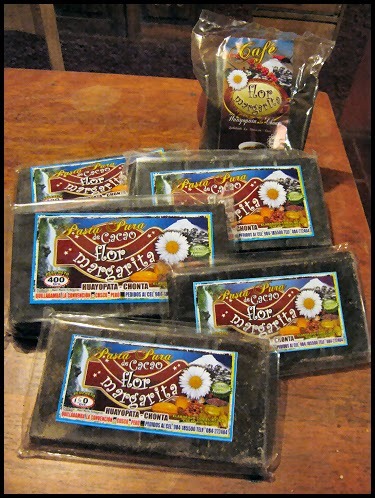 bars of the organic chocolate for 10 soles each ($3.20). Most will go to my daughter, Rebecca, who missed this tour last year. They were also selling local organic coffee, which I also could not resist. 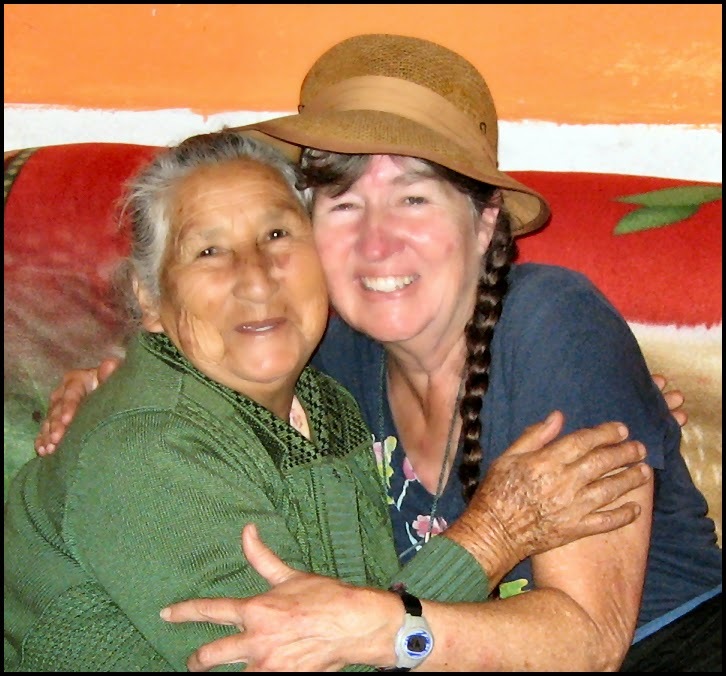 After one last hug with Margarita, we walked back to Julia and Jose’s farm to eat lunch and depart back over those windy-twisty roads home. I had had such a good time in this short weekend, that I almost cried as we waved goodbye to this remarkable family. Able, our guide, asked the driver to stop on the return trip at this mirador (lookout) to see the entire valley below us before we went over the Andean pass. Raul’s Bees. Check out the cute little hives on the right. If you are visiting the Cusco area, I highly recommend this tour to Raul’s and Julia and Jose’s farms. Abel, our guide, told us that the ChocoMuseo does not make money from these tours—they have been created mainly to benefit the farmers and to educate others about these fascinating crops. For more information, contact the ChocoMuseo in Cusco or Ollantaytambo.